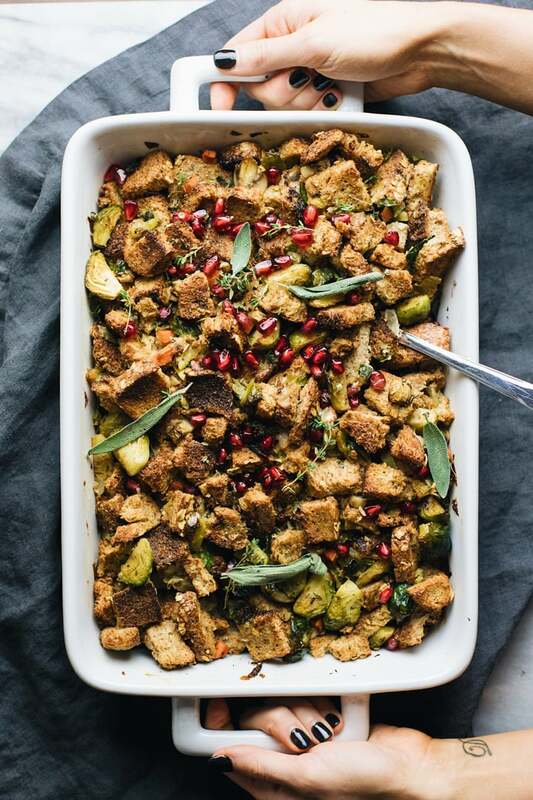 This healthy Thanksgiving stuffing will be the star of your Holiday feast. 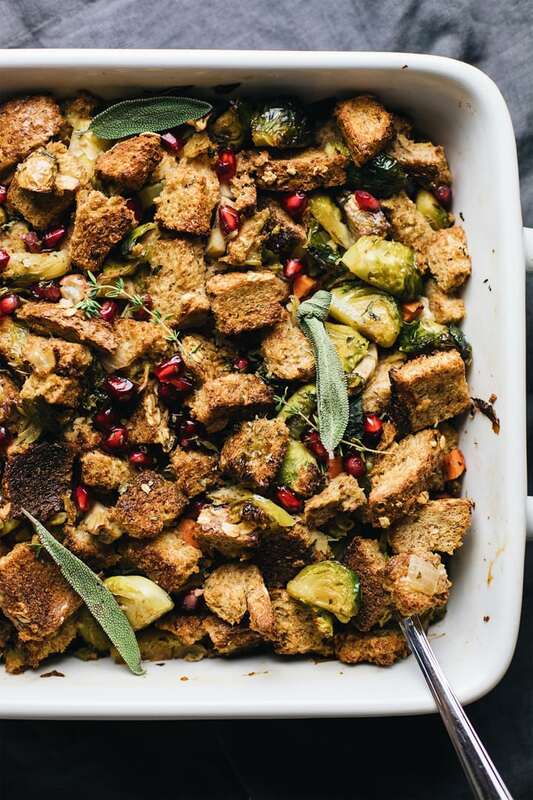 It’s the most fragrant, moist, herbed stuffing with buttery sautéed vegetables and sweet pomegranate seeds over top. A delicious Thanksgiving side dish that the whole family will love! Thanksgiving isn’t complete without herby, fragrant, moist stuffing to compliment your holiday feast. Next to mashed potatoes, stuffing is the most popular Thanksgiving side – and rightfully so. This recipe is made with healthy grain bread, buttery sautéed vegetables, and delicious herbed flavor with sweet pomegranate seeds on top. 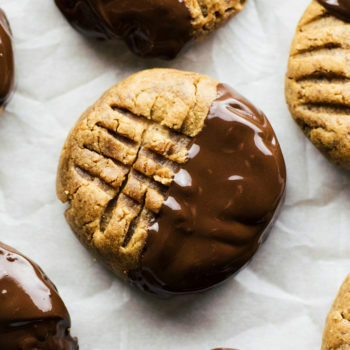 It’s incredibly simple and so good! The one technical difference to “dressing” and “stuffing” is how they are both cooked. Stuffing is what I call the oh-so famous breaded side that soaks up gravy and sits besides the turkey. Technically, however, this is considered dressing. It’s only stuffing if it’s baked inside the turkey. My family has always cooked our stuffing/dressing either in a slow cooker or baked in the oven. What kind of bread is used for stuffing? 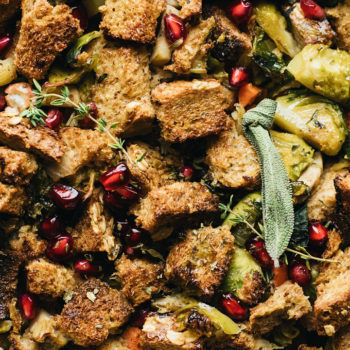 Bread is the backbone of your stuffing. You can use just about any kind, from white sandwich bread to rustic artisan loaves, or gluten free bread. For cornbread, the bread must be dried so it can absorb the flavors of the other ingredients. Toast bread on LOW broil for 8-10 minutes then flip bread cubes and bake an additional 5 minutes or until golden brown. Saute vegetables in butter for 10 minutes until soft. Preheat oven to 350F. Then mix bread, vegetables, chicken broth, eggs, and herbs together. Pour stuffing mixture into a 9×13 baking dish – cover with foil and bake for 20 minutes covered, then remove foil and bake uncovered for 15 minutes. Remove from oven and top with pomegranate seeds and fresh herbs. Dry the bread – toast bread cubes with broil on LOW for 5-8 minutes then flip bread cubes and toast for 3-5 additional minutes. Stale bread works perfectly too. Fixing “dry” stuffing – Add 1/2 to 3/4 cup more of chicken broth and bake covered for an additional 8-10 minutes. 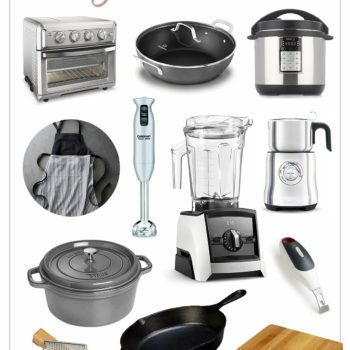 Choose any kind of bread for your stuffing. Vegetables for stuffing – use your favorite vegetables for stuffing. Some of my favorites are cauliflower, butternut squash, brussels sprouts, mushrooms, and carrots. 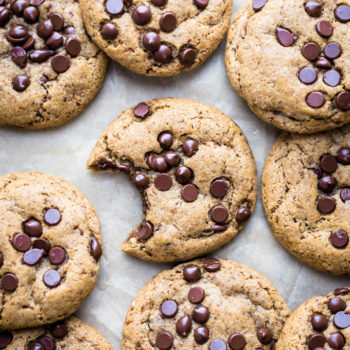 You can also add cranberries or pecans/walnuts for added toppings. 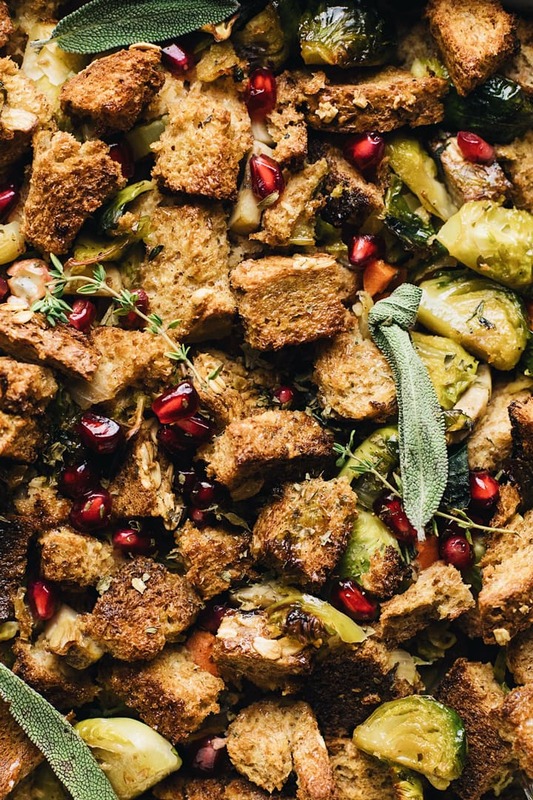 This healthy Thanksgiving stuffing will be the star of your Holiday feast. It's the most fragrant, moist, herbed stuffing with buttery sautéed vegetables and sweet pomegranate seeds over top. A delicious Thanksgiving side dish that the whole family will love! Set your oven broil to LOW - lay bread cubes out on a sheet pan. Bake in oven for 8-10 minutes then flip bread cubes and bake for an additional 5 minutes or until they are golden brown. Then set oven to 350F. In a large pan or medium pot: on medium heat add butter, celery, onion, carrots, and brussels sprouts and saute for 8-10 minutes until vegetables are soft. Then add mushrooms with 1/2 tsp salt and 1/4 tsp black pepper. In a large bowl add stuffing bread, sautéed vegetables, 2 cups chicken broth, 2 eggs, and herbs. Mix ingredients together then pour stuffing mixture into a 9x13 baking dish. Cover with aluminum foil and bake for 20 minutes at 350F. Then, remove foil and bake uncovered for an additional 15 minutes. Remove from oven and sprinkle with fresh herbs and 1/4 cup pomegranate seeds. Dry the bread - toast bread cubes with broil on LOW for 5-8 minutes then flip bread cubes and toast for 3-5 additional minutes. 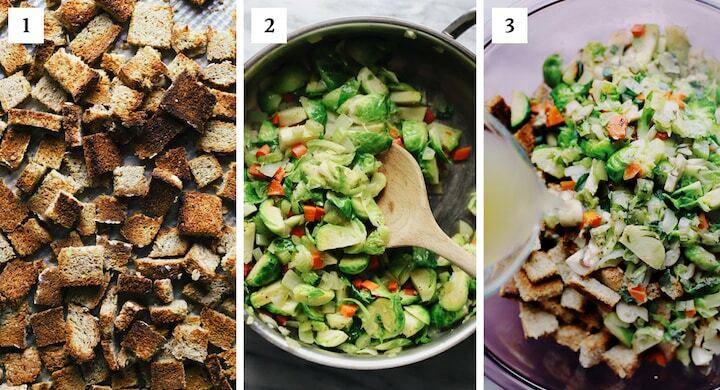 Stale bread works perfectly too. Fixing "dry" stuffing - Add 1/2 to 3/4 cup more of chicken broth and bake covered for an additional 8-10 minutes. Vegetables for stuffing - use your favorite vegetables for stuffing. Some of my favorites are cauliflower, butternut squash, brussels sprouts, mushrooms, and carrots. You can also add cranberries or pecans/walnuts for added toppings.